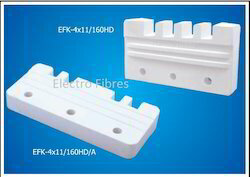 Manufacturer of a wide range of products which include finger type insulators. Noted among the topmost organizations, we have been committed to manufacture, supply, trade and export quality assured Finger Type Insulators. This product is precisely engineered and manufactured by incorporating latest technology and techniques in order to provide finest quality. Our offered product is widely used in commercial, industrial and residential sectors. Looking for Finger Type Insulators ?